While the world holds its breath for the launch of BlackBerry 10, it seems the execs are struggling to talk about it. With any brand trying to relaunch itself, we're used to the tranche of interviews with key executive members showing the world that things are now all better and missing out on the new product would mean missing out on the greatest thing ever. However, sometimes the message can overwhelm the ability to hold a normal human conversation, and that's precisely what happened to Stephen Bates, RIM's European MD, when speaking about the launch on BBC Breakfast. Bates was clearly ready for this little media tour, having learned the press release by heart, and was full of the buzzwords surrounding "transition" and "mobile computing" and most importantly "excited", a word he used in various guises no fewer than seven times in a three and a half minute interview. However, at no point did he answer the question about RIM's dramatic plunge in smartphone market share. The question was subsequently asked again, more succinctly: "What went wrong?" In response, Bates stayed firm in his decision to be a press release on a stool, pointing out that RIM "took the decision" to make its own mobile OS, which will provide all manner of wonderful things for its loyal bunch of users – without coming close to acknowledging the response required. Embarassingly the question was asked for a third time "– Yes, but what went wrong?" – at which point it became clear that RIM had briefed all staff not to talk about anything other than the "excitement" of the launch today. The same routine was heard on BBC 5 Live Breakfast – the presenter repeatedly asked what RIM had learned from the rise of the iPhone, and while Bates wasn't so effusive in his use of the word "exciting", he still was unwilling to answer the question, which was asked multiple times and more aggressively in each instance. After this line of interrogation was given up, when asked about the features users should be excited about for BB10 Bates surprisingly couldn't give an answer beyond a press spiel about BlackBerry Balance that, to those that have never used it, made little to no sense. Both interviewers were forceful in their questioning, but only because the response to a reasonable question – be it the impact of the iPhone, or why RIM sank from such great heights – was met with the verbal equivalent of a man waving a shining sign with the words 'BLACKBERRY 10 IS EXCITING' on. Both sensed blood over a point many people are wondering, and in refusing to even acknowledge the question RIM has shown fear for rival products instead of pride in its ability to compete. 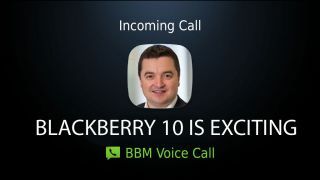 It would be easy to just attack the interviewee, labelling Bates as the wrong choice to be wheeled out to the Cornflake-munching masses, but in truth it paints a worrying picture about RIM's BlackBerry 10 strategy. He was clearly told not to mention competitors or any negativity, and in the face of such direct questioning retreated behind his key phrases. But that doesn't change the fact that those who aren't really bothered about smartphones but have heard about 'some new BlackBerry' won't have been filled with confidence. Even Nokia, the company that will spend hours talking about how every little thing it does is the greatest thing ever, acknowledged it has made some mistakes – that "burning platform" memo didn't leak itself. The launch of BlackBerry 10 was supposed to be simply a new OS with alternative phones and the chance for RIM to almost apologise for making a mistake before offering a great solution. But thanks to these interviews all the talk will be how the company is just another egotistical monster forcing marketing guff down users' throats rather than giving a strong reason to part with a large amount of cash each month. The horse has already bolted in the UK for RIM in terms of the impression the general public has been given of BlackBerry 10, so here's hoping that when CEO Thorsten Heins takes to the stage to formally reveal an OS we've already seen a few times, he actually talks like a human; one that expresses gratitude for those that have stuck with BlackBerry during the last few years when the competition has given consumers better choices. Or at the very least, keep away from the word excited.